Throughout South Africa, visitors can find excellent camping facilities. It may be best to call or email your chosen camp site ahead of time to ensure there is space for you. Moonshine Backpackers Located in Cintsa, Moonshine has both rooms and camping available. Facilities include a bar, barbecue, large indoor lounge with pool table and is quite clean. The Wild Coast is just a 2 minute walk away with good surfing, fishing and snorkeling possibilities. Gecko Rock Gecko Rock farm is located just outside Touws Rivier in the Western Cape of South Africa. Facilities set in the beautiful bushveld include several private camp sites with barbecue facilities, kitchen area and ablutions with toilets and showers. Activities visitors can take part in are 4x4 lessons, motorcycling, rock climbing and hiking. Find out more about the farm at Gecko Rock. The Beach Camp is located in the Cape Columbine Nature Reserve just outside the quaint fishing town of Paternoster on the West Coast of South Africa. It is right on the sea with activities such as canoeing, kayaking, snorkeling, walking and fishing right at your fingertips. You might want to try catching some crayfish to later cook on the communal barbecue. 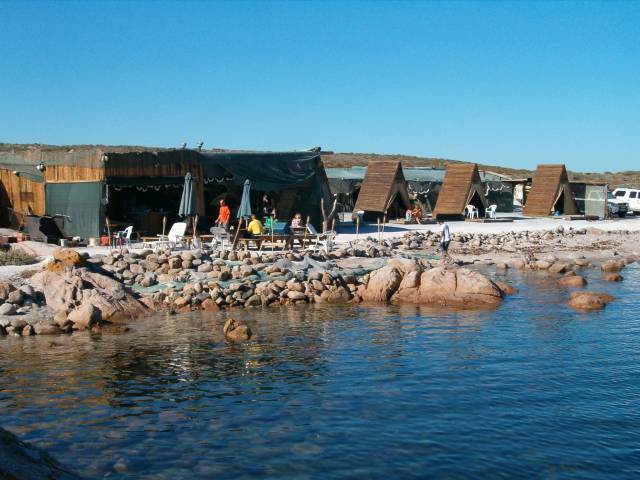 The camp has a great atmosphere, cool A-Frame huts, tents and excellent ablutions for you to enjoy. Find out more about the The Beach Camp. Gekko Backpackers - Cirtusdal The Gekko Backpackers, 20 kilometres from Cirtusdal just off the N7, is a short hop from the impressive Cederberg Mountains and has excellent facilities. There is a clean kitchen with a communal fridge, a bar area, dorms, double rooms, camping pitches and clean toilets, showers or ablutions. Activities to be enjoyed in the area include hiking, mountain biking, skydiving, river tubing and rock art. Augrabies Falls Backpackers and Kalahari Adventure Centre The Augrabies Falls Backpackers and Kalahari Adventure Centre offer an excellent place to rest close to the falls and on the way to the Kalahari Transfrontier park. The facilities include dorms, double rooms and camping. There is a communal kitchen, bar area, pool table, television and barbecue area. The camping is on the grass lawn on site and the toilets, showers or ablutions are clean. In addition to the accommodation facilities, the Kalahari Adventure Centre also offers Orange River rafting and canoeing excursions, visits to the Kalahari desert and horse riding. Find out more at their website, Kalahari Adventure Centre. Kalahari Transfrontier Park Find out about camping and other accommodation options on our page dedicated to the Kalahari Park.